This rustic, no-knead loaf is slightly sweet, thanks to a touch of molasses, and oatmeal gives it a nice, chewy texture. Combine yeast, 1½ cups flour, oats and salt. Heat water, oil and molasses to 120-130°F. Add liquids to flour mixture; blend on low speed. Beat 2 to 3 minutes on medium speed. Add egg; beat 1 minute. By hand, gradually stir in remaining flour to make a stiff batter. Scrape batter from side of bowl. Cover; let rise in warm place until doubled, about 30 to 40 minutes. Stir down batter. Pour into 1½ - or 2-quart casserole dish or skillet. Let rise in warm place about 30 minutes. Lightly brush with egg wash and sprinkle oats over the top of loaf (optional). Bake in preheated 375°F oven 40 to 50 minutes or until well browned on sides and top. Remove from casserole dish/skillet. If desired, brush with butter; cool on rack. You can substitute Instant (fast-rising) Yeast in place of Active Dry Yeast in batter/no knead recipes. When using Instant Yeast, expect your batter/dough to rise about 50% faster. Adjust your rise times accordingly. Traditional methods: use equal amounts; Bread Machine: use ½ tsp Instant Yeast OR ¾ tsp Active Dry Yeast per cup of flour in your recipe. Visit our Lessons in Yeast & Baking for more information on baking. You can use either size. 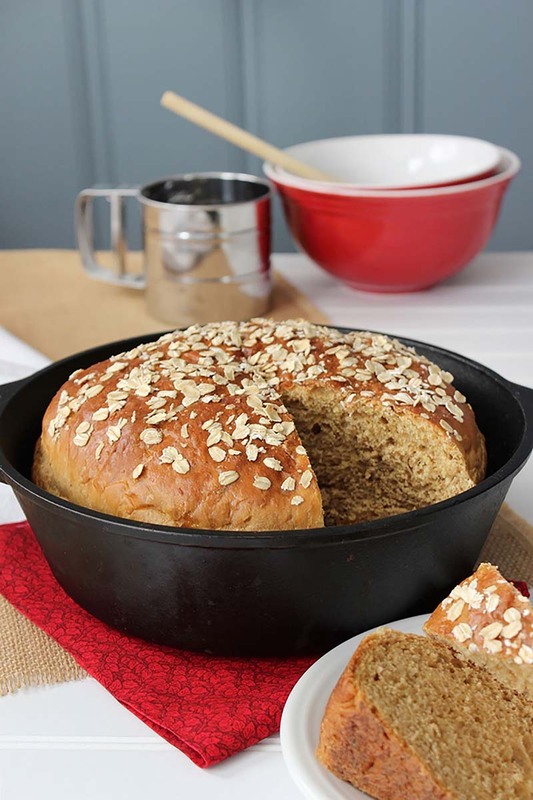 The 10-inch skillet will yield a bit taller loaf than the 12-inch skillet.